Higher level exterior windows are cleaned using long reach poles with the cleaning power of D-Ionized water. Water spots are a thing of the past. Additional service can include oxidation cleaning and the removal of hard water marks from sprinklers. We have the knowledge and experience to clean your windows. You can count on CEBM to do the job right. We are experts in water conservation. Under no circumstance will water be wasted. We supply water to the job site to insure drought compliance. A lot of window washing companies must use your water. Not CEBM. We bring our own water. You will not see a spike in water usage or excess water charges. We offer pressure washing for exterior sidewalks and main entrance areas. 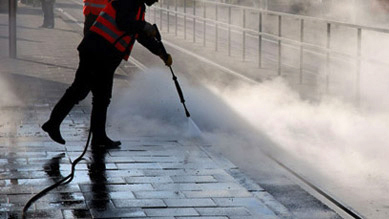 Steam cleaning machines will remove gum/tar to enhance the appearance of your facility. Our dedicated water recovery system captures all overflow water and deposits the water in designated plant areas. A win-win for everyone.